A hoist is a tool designed for lifting or lowering loads. They utilize a lift wheel or drum in conjunction with various lifting mediums such as wire rope or chain. These can then be designed for manual use, electrically powered or pneumatically powered and can range from small capacities to enormously large ones. 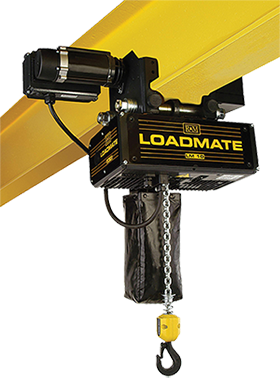 Most hoists are then mounted on overhead cranes for the movement from location to location. Various industries heavily rely on hoists for their everyday needs from mining and construction to fabrication and industrial settings. These can be custom designed or pre-engineered units, with a variety of options to fit every application you can think of.